Glucocorticoids have many mechanisms of action, including transactivation, transrepression, physicochemical effects on cell membranes, synchronization of cell division and tissue remodeling, cross-reaction with other steroid hormone receptors (mineralocorticoid receptor), and others. Individually, each mechanism of action leads to a balance of efficacy vs. side effects in any specific disorder to which glucocorticoids are prescribed. For example, in DMD, the anti-inflammatory effects via transrepression pathways (NF-κB inhibition) are likely responsible for much of the efficacy seen. However, other subactivities lead to side effect profiles that detract from patient quality of life, such as effects on bone structure and function (transactivation subactivity), and the stimulation of muscle atrophy pathways (induction of atrogenes also via transactivation). Vamorolone is a new first-in-human investigational steroidal drug that effectively separates a number of subsactivities seen in traditional glucocorticoid drugs. As such, it is often called a ‘dissociative steroid’, is that it retains subactivities associated with efficacy (transrepression, physicochemical membrane effects, synchronization of tissue remodeling), and dissociates these efficacy-subactivities from other subactivities more associated with detrimental side effect profiles (transactivation subactivity). Four of the subactivities of glucocorticoids are described in more detail below: Transrepression, transactivation, physicochemical membrane effects, and synchronization of tissue remodeling. Transactivation is the best-studied of the properties of glucocorticoids and all steroidal hormones and drugs (testosterone, estrogen, vitamin D, etc. ), and has been more associated with side effects rather than efficacy. It involves the lipophilic steroid diffusing through the cell membrane. In the cell cytoplasm, the steroid ligand then binds to the cytoplasmic nuclear hormone receptor (glucocorticoid receptor [GR] for prednisone and cortisol). The receptor ligand complex then translocates to the cell nucleus, where the complex seeks out specific DNA sequences (nuclear hormone enhancer elements). For glucocorticoids, the specific enhancer element is called a GRE (glucocorticoid response element). When the ligand/receptor complex is bound to the GRE, it then typically activates gene transcription, making more of the gene mRNA and protein product. As the ligand-complex typically activates the target genes, the process is called transactivation. 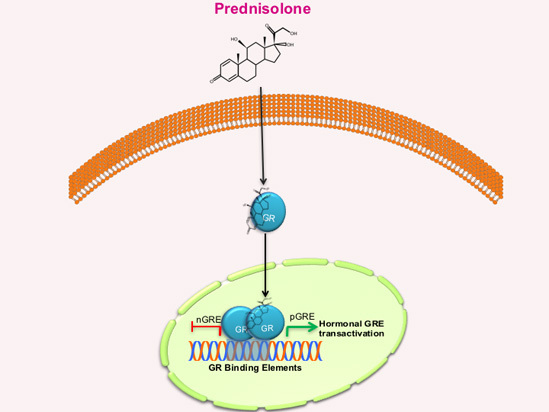 Prednisolone showed a dose-dependent increase in GRE-mediated transactivation activity, whereas vamorolone did not, suggesting that vamorolone may potentially have a reduced GRE-mediated side effect profile. Glucocorticoids are well known to have potent anti-inflammatory activities, which are thought to be mediated by repression of a specific inflammatory pathway, called NF-κB (NF kappa B). This is known as transrepression. NF-κB complexes are activated by multiple types of pro-inflammatory molecules and pathways (eg. TNF-mediated activation). Once activated, NF-κB receptors translocate to the cell nucleus, and then bind to specific DNA sequences (NF-κB elements) near pro-inflammatory genes and repress the action of NF-κB gene activation. NF-κB activation is recognized as one of the earliest molecular features of Duchenne muscular dystrophy. 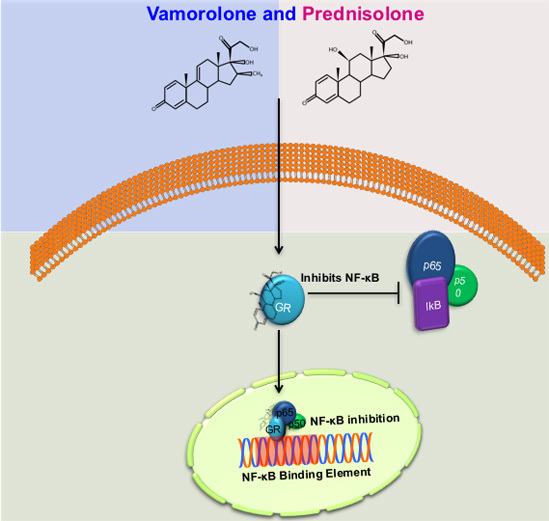 Vamorolone is optimized to retain transrepression activities, and has similar NF-κB inhibition when benchmarked against prednisolone in muscle cells in vitro. Steroids are lipophilic molecules, where they bind lipids (fat) more easily than water and able to cross plasma membranes where they can exert direct physicochemical effects on the membranes. Duchenne muscular dystrophy is caused by dystrophin deficiency at the plasma membrane of muscle cells, causing plasma membrane instability. Normal muscle activity can cause breaks in the myofiber plasma membrane, raising serum creatine kinase levels, and causing eventual muscle weakness. 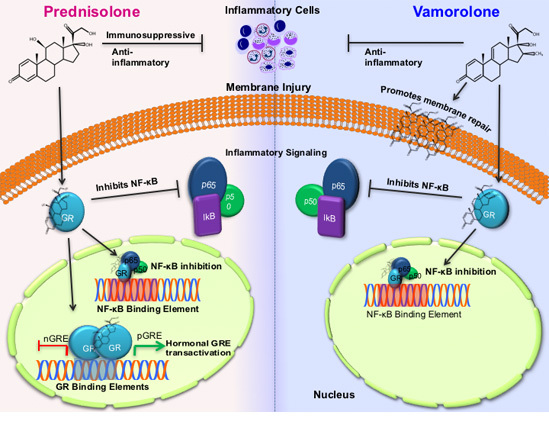 Vamorolone was shown in animal models of DMD to protect against membrane damage, whereas prednisone was found to exacerbate membrane injury and wound healing. This suggests that vamorolone could counter-act the membrane instability due to dystrophin deficiency in DMD. Visit this page for more details on DMD. http://www.ncbi.nlm.nih.gov/pmc/articles/PMC3135846/). Briefly, airway cells isolated from normal individuals can repair a wound effectively, and this is done by the participating cells communicating with each other to synchronously divide and fill the wound site. Asthmatic cells seem unable to synchronously repair a wound, showing instead a chronic inflammatory state that inhibits their repair effectiveness. Glucocorticoids appear able to rescue this defect in asthmatic cells, forcing them into mitotic synchrony, and then better able to repair a wound. Recent published data has shown that this cell-cell communication is required for this effect (http://www.ncbi.nlm.nih.gov/pubmed/24669775). In dystrophic muscle, a similar asynchrony effect has recently been demonstrated, where glucocorticoids, as well as vamorolone, are able to better synchronize regeneration of muscle (http://www.ncbi.nlm.nih.gov/pubmed/25313409). This newly emerging data suggests that a fourth subactivity of glucocorticoids, namely synchronization of tissue remodeling, may underlie a significant proportion of the efficacy of these drugs in chronic inflammatory states. 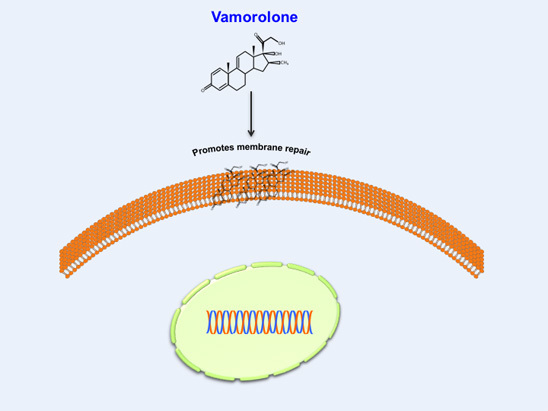 Vamorolone appears to retain this subactivity.